Domino's pizza is Indian's favorite pizza shop. 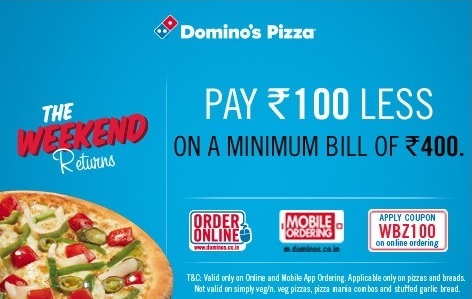 Domino's pizza is now offering flat Rs.100 discount on a minimum bill of Rs.400 as a weekend offer. Pay just Rs.300 for order value of Rs.400. Read Terms & conditions carefully to enjoy Domino's Rs.100 off offer code. How to avail Dominos 100 off coupon offer? 1. Visit Dominos. You can order through desktop website, mobile or app. 2. Add the products to the cart. 3. Apply coupon code 'WBZ100' before making payment. Enjoy Rs.100 off. 1. Terms and conditions of Domino's pizza is applicable. 2. Valid only on pizzas and breads. 3. Valid only on online and Mobile App ordering. 4. The offer is not applicable on simply veg, veg pizza, pizza mania combos and stuffed garlic bread. 5. You should bill for at least Rs.400 to get Rs.100 off. 6. This is a limited time offer.